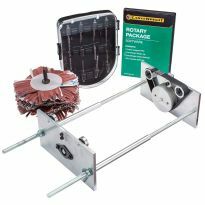 Boasts large capacity, a small footprint and a powered spindle—accessory box includes a wide variety of bits, a sanding mop and advanced software. A CNC with both large capacity and a small footprint seems like an impossible dream, but the CarveWright CX makes that dream come true. Thanks to the CarveWright's unique conveyor belt system, the machine can accept workpieces up to 12 feet long, despite having a footprint the size of an ordinary planer. Instead of a space-hogging bed and gantry to accommodate large workpieces, the CarveWright features a precision conveyor that moves the workpiece itself past the cutting spindle. Unlike many CNCs, the spindle is also built into the machine, meaning you don't have to purchase a separate router. With the included easy-to-use drag-and-drop software, plus the built-in automated setup features, you can easily create stunning carving projects in very little time. Optional add-on apps can enhance your capabilities, while the CarveWright Pattern Depot gives you access to over 7,000 patterns and projects to download. 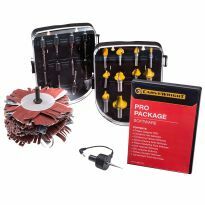 In addition, this package also includes a dust shroud with a 2-1/2'' dust port for connection to your dust collection system or shop vacuum. 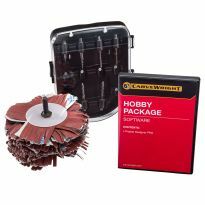 Package includes the Sign Maker Accessory Box, boasting a wide selection of router bits, a sanding mop and advanced software features! 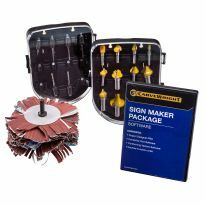 The Sign Maker Accessory Box includes the 6-piece BASIC Cutting & Carving Router Bit Set and 11-Piece Full Decorative Router Bit Set plus the 240-Grit Double Sanding Mop, and Project Designer PRO 3 with a trio of add-on modules useful for making signs: Centerline Text, Conforming Vectors, and the Keyhole Function with Router Bit. 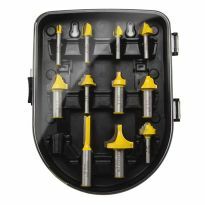 The BASIC Cutting and Carving Bit Set features six top-quality solid carbide bits designed for durability and precision. Each bit (except for the 1/16'' cutting bit) features a 1/4'' shank that is permanently fitted with a CarveTight adapter for a slip-free fit. 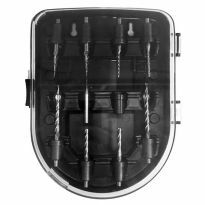 The bits in the 11-piece Full Decorative Bit Set set are carbide-tipped. Use them for a variety of decorative effects, dados, recesses and edge profiles. The set also includes a 1/4'' Split Collet and 11 rubber stop collars, necessary for installation in the CarveTight spindle. 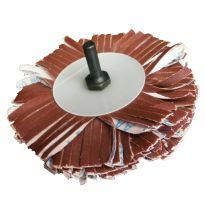 The Double Sanding Mop is the ideal tool for quickly and efficiently cleaning up your CNC carvings and other contoured woodworking projects. Simply chuck the mop into a drill press or portable drill to quickly remove machining marks and prepare your projects for finishing. With 3'' of thickness, the double mops are great for larger projects. The included rubber spacers and nylon stabilizers can be rearranged to adjust the softness of the mop. Project Designer PRO is an upgraded software package that features numerous advanced design tools and uploading capabilities not included in the basic software package. All available add-on modules are also compatible with Designer PRO, three of which are included with the Sign Maker Accessory Box (see below for details). Centerline Text Add-On: The Centerline Text feature adds an additional rout mode for the Text Tool feature. This feature uses the 60° and 90° V-groove bits to follow the center of the letters for a clean engraved, v-cut look. Conforming Vectors: Conforming Vectors allows for v-bit routing along a carved surface. Without Conforming Vectors, these types of routs can only be made on flat surfaces. You can apply the conform feature to any type of vector cut. Keyhole Function with Bit: The Keyhole app allows for plunge cutting keyhole shaped mounting slots in items such as picture frames and plaques. This function includes a 1/4'' shank 3/8'' diameter keyhole bit. Any item that has been used, and is accepted by CarveWright for return within 30 days of the date of purchase, will be subject to a 20% restocking fee. Also, a fee will be charged for any missing components or damage to the machine, parts, accessories, and shipping. With the Rockler Protection Plan, you'll get accidental damage coverage immediately upon purchase of your tool. Plus, we will extend the manufacturer's warranty for your choice of an additional 1 or 2 years. We'll take care of all parts and labor for any repairs, with no deductibles and no hassles. If your tool can not be repaired, we'll gladly replace it. Available in the US only. Click here to learn more. I’m very happy with this tool. It has served me well with my woodworking hobby. It take some time to carve the workpiece out but the end result is something of beauty. This is to address the reviewer Michael P.
I'm a representative of CarveWright. We stand behind our product and do everything we can to support our customers. I'm sorry you feel like we haven't helped you through your initial learning phases. We are continuing to grow our support and tutorial documentation to improve those experiences. Please feel free to contact us if you need assistance, or visit our searchable support site at https://support.carvewright.com. This machine does a great job, when it works. It comes with known issues that for some reason the company doesn't think need to be fixed or even addressed until you discover them yourself. The customer support is awful. I called about an issue, one of many, and when I talked with a supervisor, I was made to feel as if the problems with their machine were my fault. My machine was not working for almost a month when I first received it. Then I continued to have problems because their care and maintenance of the machine are vague. When I asked for some compensation for not having a working machine for over a total of 2 months, I was given a $10.00 Christmas ornament pattern. Research what your total investment will be if you decide to buy this machine, you have to buy everything from CarveWright, patterns bits, all add-ons. You can not use your own CNC pattern programs with this machine, you have to figure out how to convert them to this machines program or buy their patterns. Can i cut out a design like a shield, in say a 3/4" thick piece of walnut, and route the design in it also? If you can design it to fit it can do that. Kind of hard to watch the progress on this machine and the sensors kept it from being trouble free for me. Thank you for your response back. Is there a better option for what I'm looking for? Is the machine capable of carving on a curved surface such as a wine barrel or bourban barrel stave? I bought one second hand and has some issues I would like to know if and where I can send this into to have it refurbished???? BEST ANSWER: The machine should be sent to CarveWright for refurbishing, where it will be repaired and brought back to factory spec. 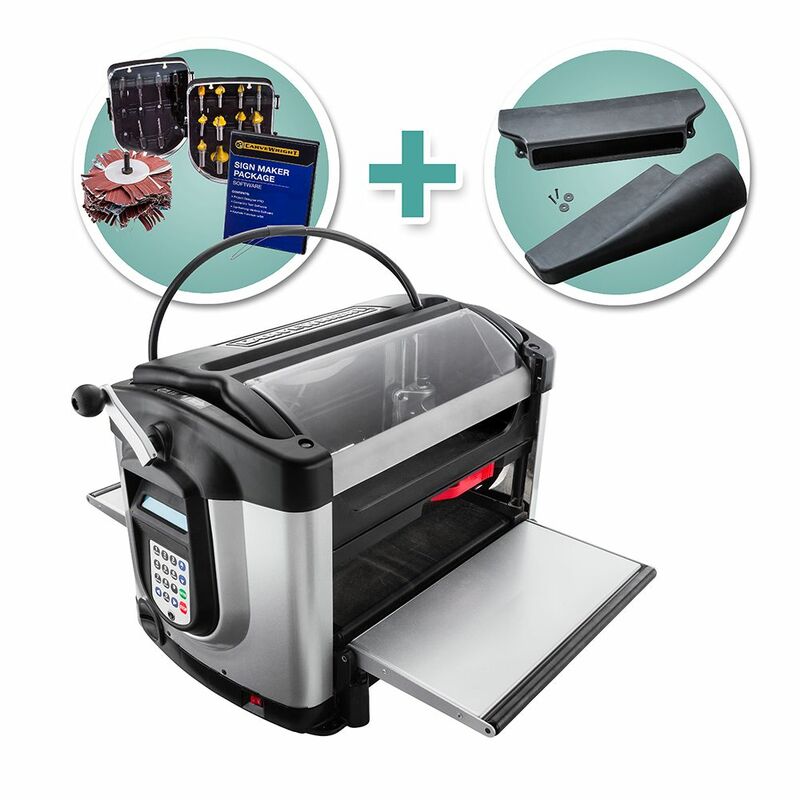 Be advised that, to ensure your machine is properly protected during shipment to / from CarveWright, you should contact CW to obtain the UPS-approved shipping box, in case you didn't get that packaging when you bought your machine. It is my understanding that UPS will not insure your machine against shipping damage unless it is shipped in the approved packaging. 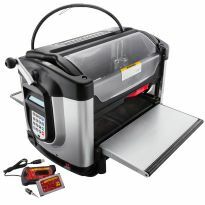 Can I create a design using Inkscape, and save it to transfer to use in the CarveWright CX - 3D CNC System?